Just wanted to thank everyone here for all the great information posted on this site. I've been loitering around the site while installing a new boiler and the info I've found here has been invaluable. I just finished an oil to gas conversion in my 2300 sq foot single level ranch. 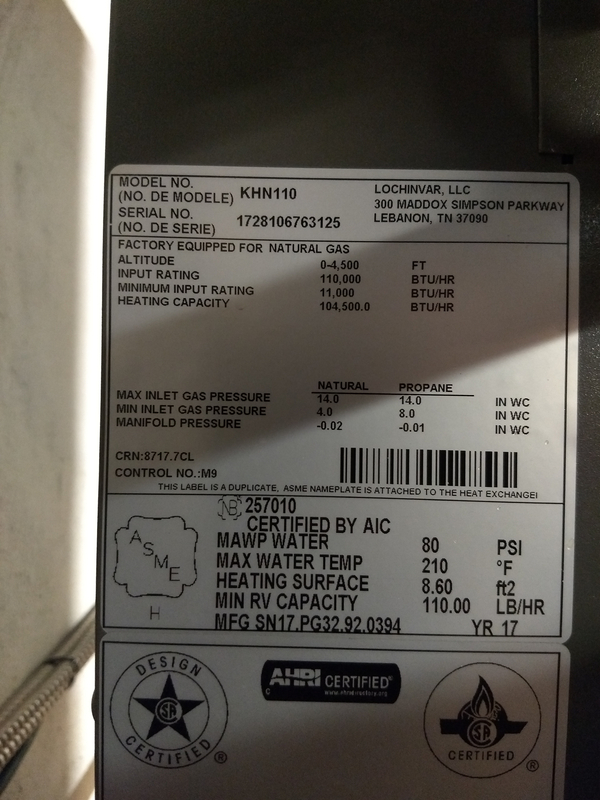 I installed a lochinvar KHN110....over sized....I know! Started with the recommendation of a friend who is a "Professional" and wanted me to install a KHN155. I knew it was more than I needed and went for the 110. After spending some time here I realized that I should have spent some more time researching! It does not seem to short cycle at all (still mild here in Rhode Island), just cruises around 15-30% depending on how many zones are calling, so i guess i will get by with it. I will post some pictures of the install for some constructive criticism! I am in the process of fine tuning and dialing my outdoor reset back as far as possible. 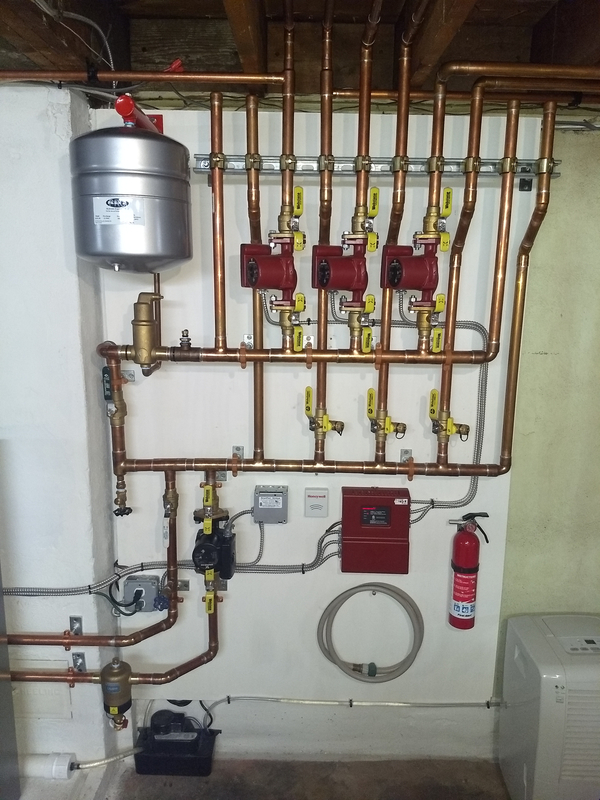 The system is plumbed primary/secondary, zoned with circulators, 3 zones, baseboard radiators. 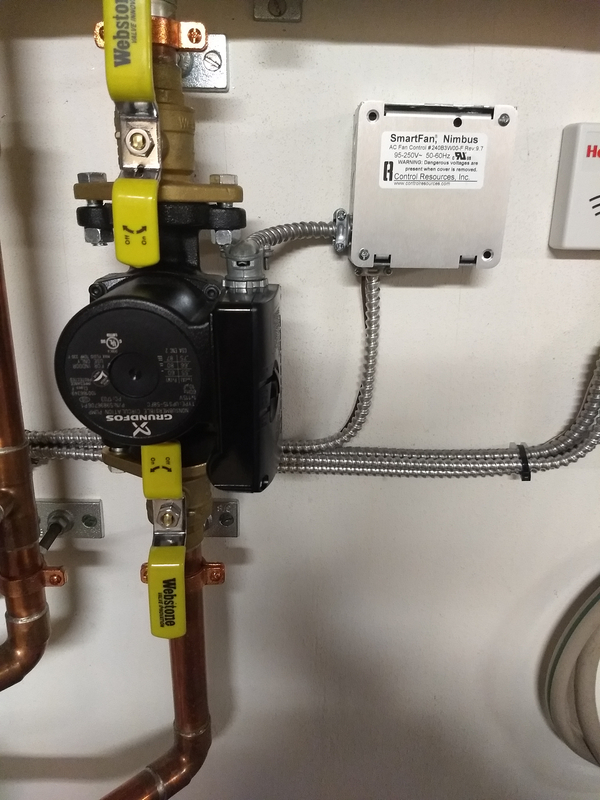 I installed a Nimbus speed control for the boiler pump so that I could utilize the boilers ability to control the boiler pump speed using the 0-10v signal. The factory default setting for the boiler delta T is 20 degrees, and it maintains that 20 degrees perfectly. I was wondering if anyone had any recommendations for what delta T I should set. The only info I can find is from a lochinvar newsletter that basically says too much flow can cause erosion of the heat exchanger. Too low of flow can cause scaling of the heat exchanger.....though i'm not sure if this even pertains to the KHN Fire Tube boiler. I am also wondering if keeping the delta T lower might increase efficiency as the whole heat exchanger has a better chance of being in the condensing range. Here are some pics of the install. Any constructive criticism would be appreciated! I would leave it until you get your outdoor reset dialed in. Seems to me it’s working great. What are your return temps? Was it determined you had more than enough baseboard to run lower supply temps? > I would leave it until you get your outdoor reset dialed in. Seems to me it’s working great. What are your return temps? Was it determined you had more than enough baseboard to run lower supply temps? 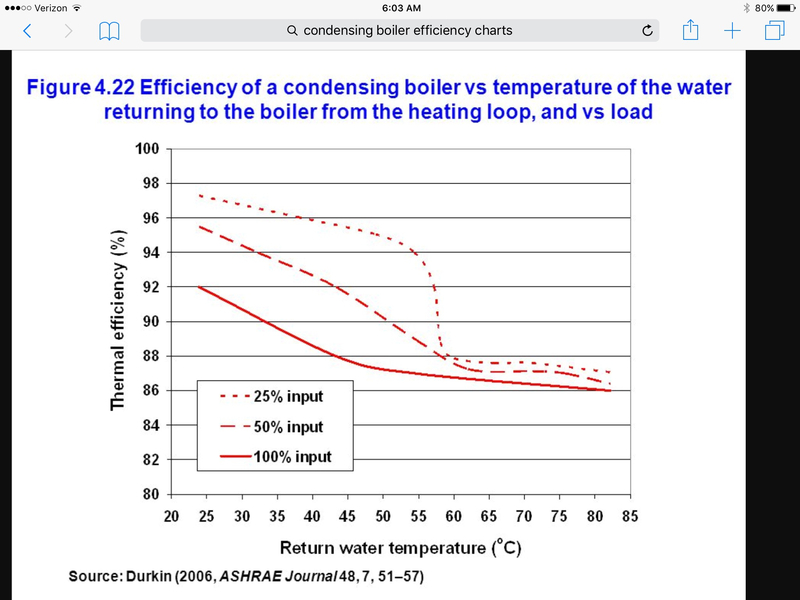 System side flow should be greater than boiler loop flow to achieve the lowest “possible” boiler return temps. However it’s limiting factor is the thermodynamics of the system side. 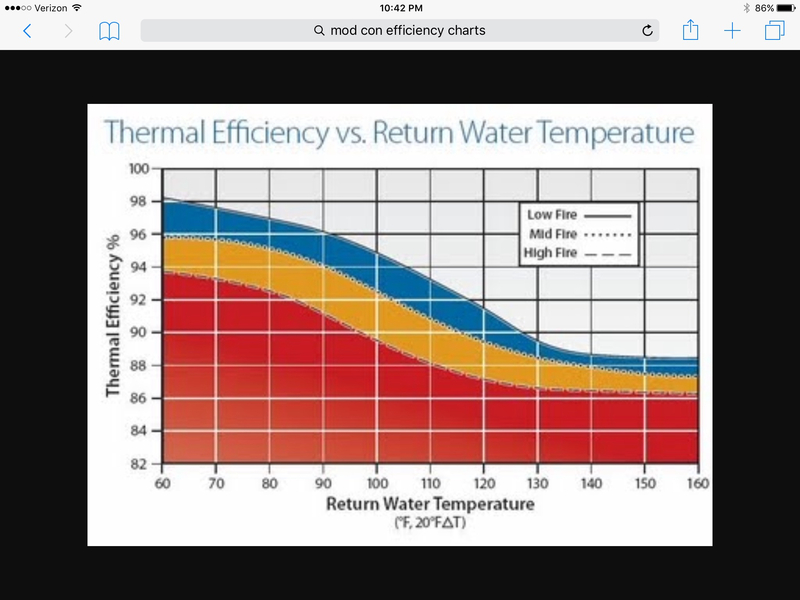 When boiler flow is greater than system side flow you are sending back hotter return water to the boiler. So until you can get the reset curve to provide the lowest possible supply temps to the radiation yet provide the best comfort. You won’t be there yet. To early in the season yet. Those are good condensing numbers. If you can go lower the better. > Those are good condensing numbers. If you can go lower the better. Great, thank you for the quick responses. I will continue to push the reset curve south and see how far I can go. Side note, just had my first Lochinvar repair. Found a small leaf in the venturi.....sounded like a helicopter taking off in my basement from the incorrect air/fuel mix. That was interesting. ^ the installer should have put 3" screens in the intake and exhaust terminations. If he didn't, you'll get more of the same over time. Here's my reset curve (1800 SQ ft house, Long Island) which has worked for two winters. I only had to adjust it last Jan when we had that week of single digit and zero deg days. Of course your's will be different, but it will give you an idea of what's possible. The goal with a mod-con is to keep the return temps below 130F as often as possible to enable condensing and high efficiency. > ^ the installer should have put 3" screens in the intake and exhaust terminations. If he didn't, you'll get more of the same over time. Thank you for the reset curve, that looks like a great starting point! Any thoughts on primary Delta T as I have the ability to control it? ^ only thing I can offer is to advise you to look at the condensing chart above and shoot for return water temps on the primary side that will keep you in condensing range. Once your RWT is over 130F you're not condensing. Nice workmanship on the install BTW!! The emitters are in control of the boilers RWT. This is where to much radiation if there is such a thing becomes beneficial. 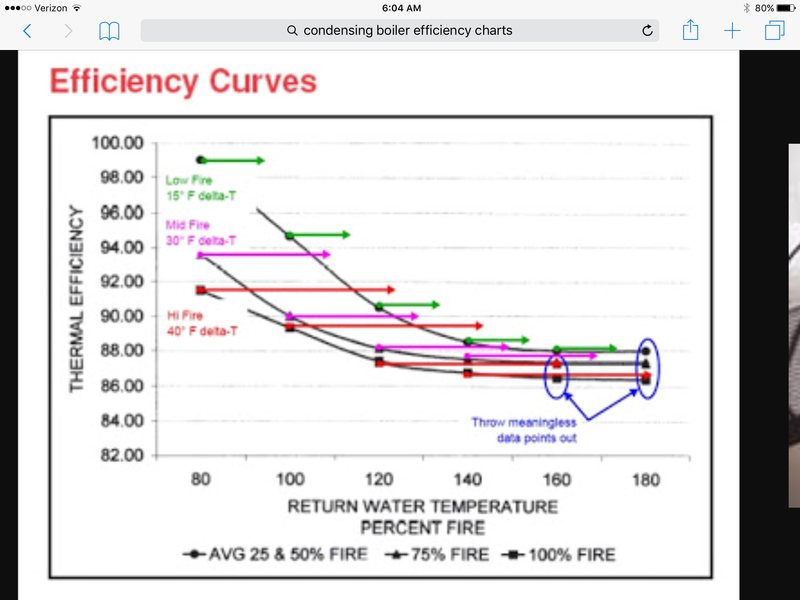 unless you have a well designed radiant system that gets rwt down in the numbers from the chart Ny Rob posted. Thanks guys. Bear with me... I may be explaining myself incorrectly. I'm a marine technician, this is my first mod/con install. Ok so I understand that there is no changing RWT because the radiation in the house determines the Delta T of the system and therefore the RWT to the boiler (so long as the primary loop is flowing less than the secondary). I ordered one up and installed it. Before installing the control, the boiler would maintain SWT just by modulating the firing rate of the boiler, and obviously the circ speed remained constant (I ran the 15-58 on medium speed). Standard operating procedure i suppose. Now that the control is installed, the boiler adjusts both the firing rate AND the speed of the circulator. 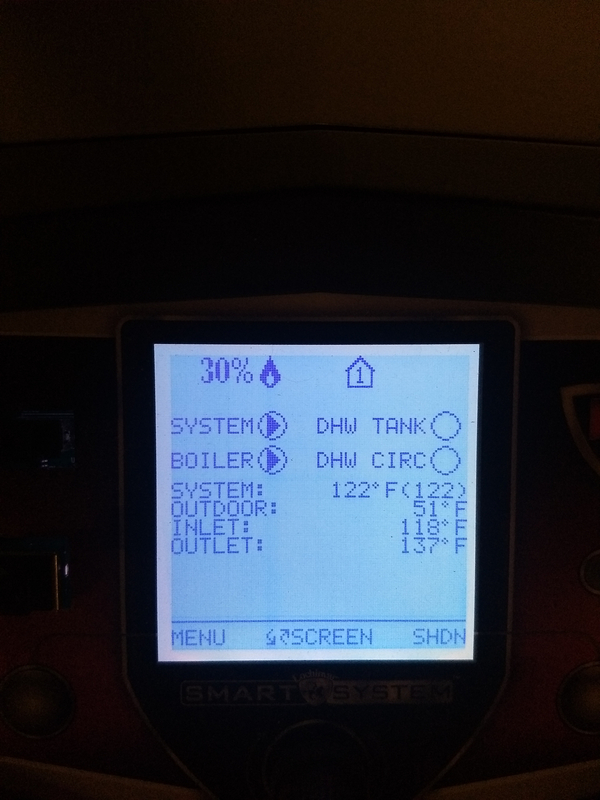 It is able to maintain both the desired Delta T across the heat exchanger AND the system temperature almost perfectly (look at my picture of the temps above. I have a target Delta T set at 20* ). The RWT is a given, it cannot be changed with the speed of the boiler circ. So it is decreasing the speed of the circ. and increasing the outlet temp in order to meet the requested SWT. It works GREAT!......but is it necessary?? 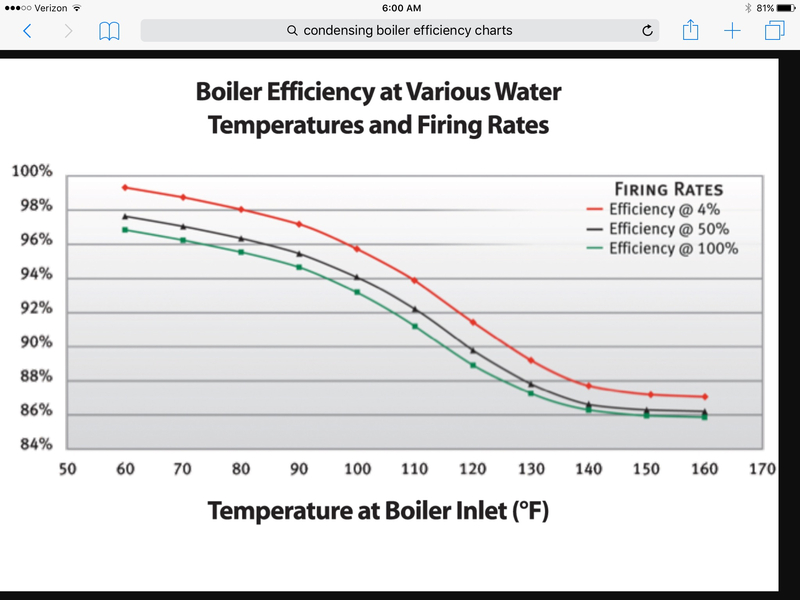 Firing rate, and boiler delta t is better managed when the flow rate is coupled with the firing rate. It keeps modulation from hunting when the circ speed is fixed. To maintain a fixed delta across the HX something has to give when three variables are in play. 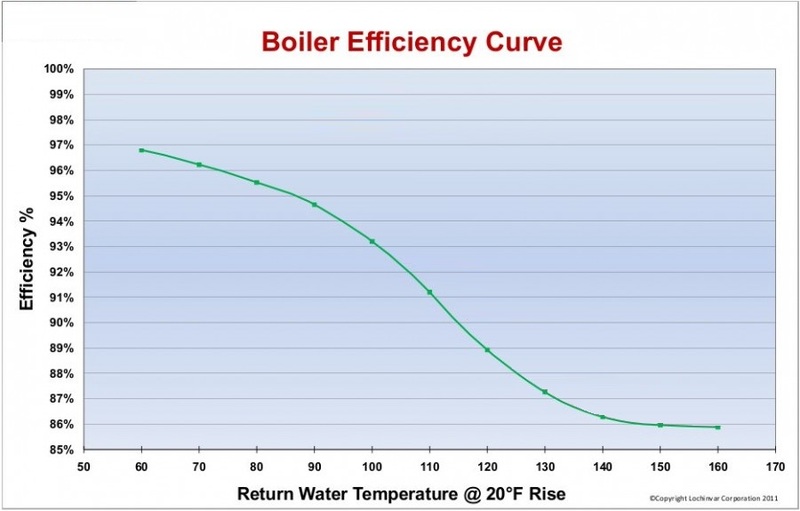 Boilers firing rate, return water temp, and flow rate. 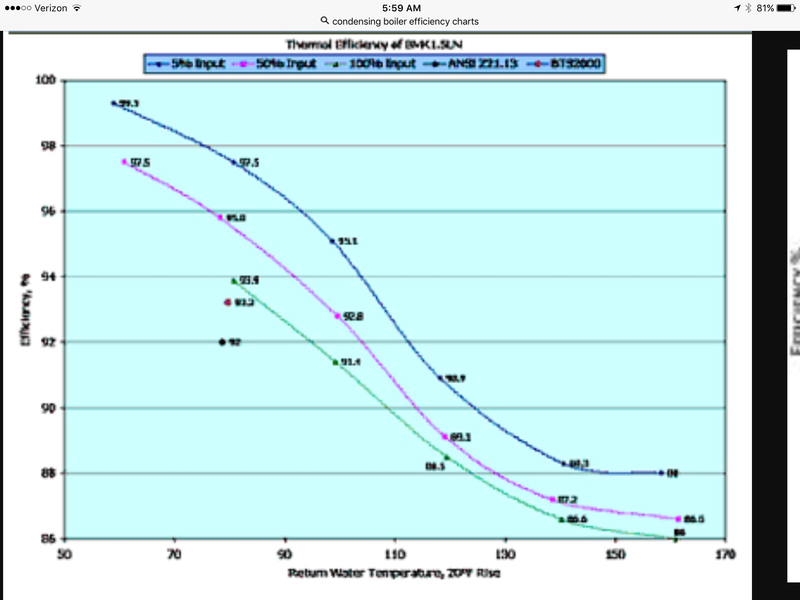 Since return water temp will be at the mercy of the emitter tightly controlled by ODR, and is not a constant through out the heating call other than the supply temp. Then the other variables back in the boiler loop are the firing rate, return water temp from the heating loop, and flow rate of the boiler loop. Are you sure it is the KHN? > Are you sure it is the KHN? Hmm can’t seem to find a manual for KHN online on lochinvars website even. It is discontinued . However I think in your manual max delta is 35 degrees in the boiler loop? So I wouldn’t go more than that if you want to play with it. That is a watertube boiler. In order to get a wider delta you decrease pump speed. If the modulation can’t go low enough you will probably cycle off hi limit due to low flow rate. Right now with a 20 delta you are 15-30% modulation so you might have a little room to go lower. Key is to have nice long cycles to reach setpoint with out hitting high limit. But like I said earlier until you dial in the reset curve, and get some real heating weather your fiddling for nothing. It could take an entire season to dial in the reset curve. Ultimately with a proper curve the thermostat becomes nothing more than a high limit device for internal, and external gains the reset is completely in the drivers seat. So it seems as though you would favor a wider Delta so long as I don't hit high limit. 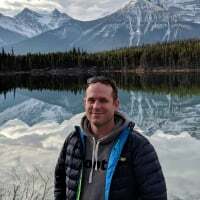 Clearly it seems I need to spend some more time with my ODR during some colder weather and try to get as close to a constant running condition as possible. Is there any chance that maybe I am assbackward, and a higher flow rate with a super low Delta (like I had before playing with circ.) would be favorable as it would keep the entire heat exchanger closer to condensing range? Okay found it, this page should be in your I/O manual. Pay close attention to the MINIMUM flow rate at low and high fire. Got it, Thank you for all your time and help Gordy. Looks like I am over complicating a pretty simple system! I will have to figure out how to determine the minimum flow rate of my primary loop....with an aftermarket speed controller, and with a pump that has no data relating to the voltage applied vs gpm output. All you really need to pay attention to is the delta. If you get higher than 35 at low fire your probably not getting the minimum flow rate, and it may lock out. I have a setpoint of 125 degrees at 20F (Design Day Temp) for my reset curve, three Alpha pump circulator zones, 2200 sq foot single level ranch built in the late ’60s. 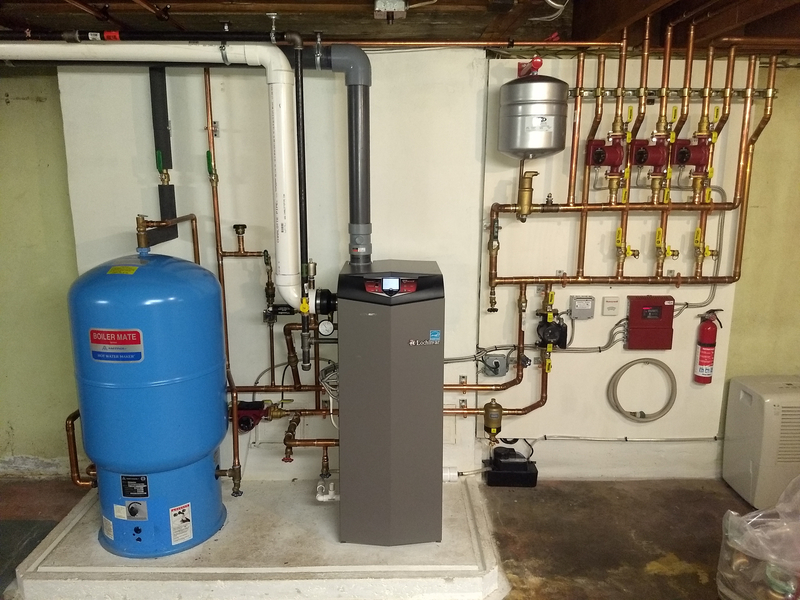 I installed a Lochinvar WHN110....over sized....I know 4-years ago! Mine only features a 5:1 turn-down ratio (22K BTU minimum) so my short-cycle management is difficult. I’m running baseboard heating, plus one kitchen kick-space heater and have added approximately 50-feet of additional baseboard over the years. My system layout is using a LOW LOSS HEADER/Hydraulic Separator in addition to a primary/secondary layout. I would love to have a variable speed Boiler Pump but am hesitant to install a Nimbus controller due to the motor type & additional electronics inherent in an Alpha pump. I’ve adjusted the three zone pumps to 3GPM flow each (trusting the Alpha displayed value) and the Boiler Pump to 7GPM which is approximately the total flow when there are two or three zones in operation. As to gas consumption… the last full year with the old boiler (w/nightly temp setback) was 2013 (4670-HDD / 855-THERMS of GAS = 5.46). With the new Mod-Con (73degrees 24/7) in 2017 (4302-HDD / 598-THERMS of GAS = 7.19). The percentage difference is 27.35% less and we’re more comfortable. And you may find that constrained delta operation and ODR may not play together well. I'm not a fan of constraining the distribution ∆. Delta is a result of what the heat emitters are and want to do, striving for thermal equilibrium. Delta T can and should vary based on ever varying loads. 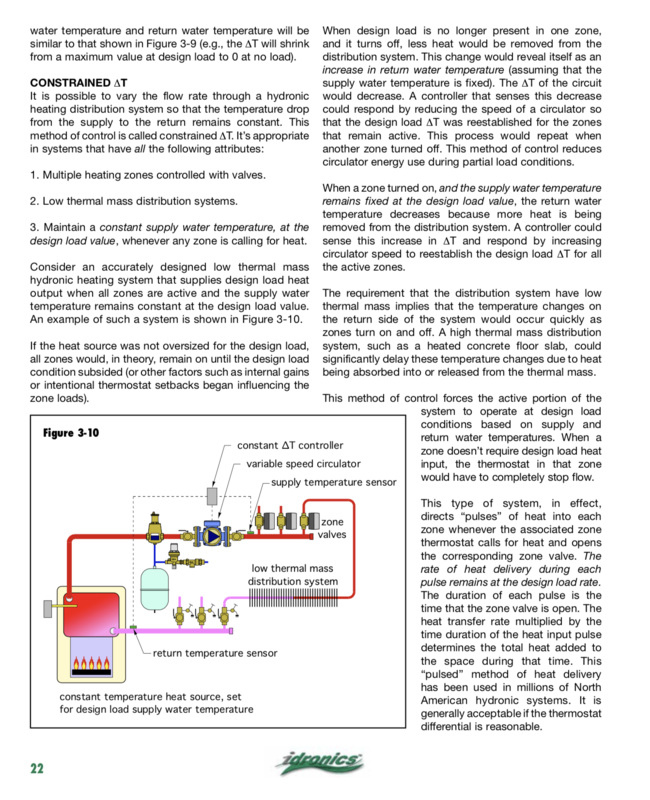 Ideally constant flow with modulating temperature and maybe TRVs as the individual control. This is the most common Euro control logic for ultimate comfort and efficiency. The rational behind the opinion here. @Adolfo2... any particular reason you went with three CH pumps vs. a single CH pump and three zone valves? @Adolfo2 awesome looking install! We have a lot in common there! I'm not a pro, just fudging it...so take my opinions with a grain of salt..
From what I had read, the Nimbus only works on PWM motors. I don't believe it will work with an Alpha ECM type pump. The controller worked excellent. 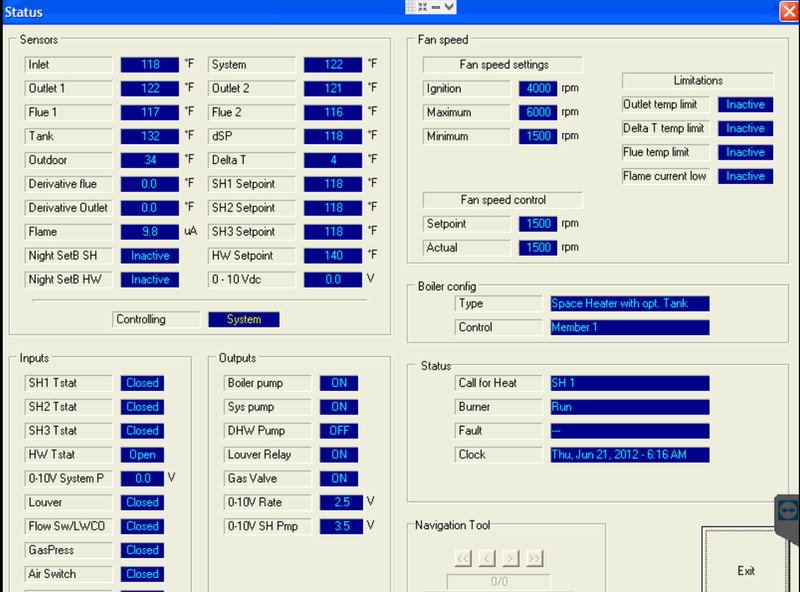 The boiler modulated the primary pump speed and put the heat exchanger delta T right on whatever delta I selected, but I have since disconnected it. I think the whole thought of using the boiler logic to control the delta T was more of a novelty to me than anything. There is no changing the inlet water temperature because that is determined by the heating load of the system. 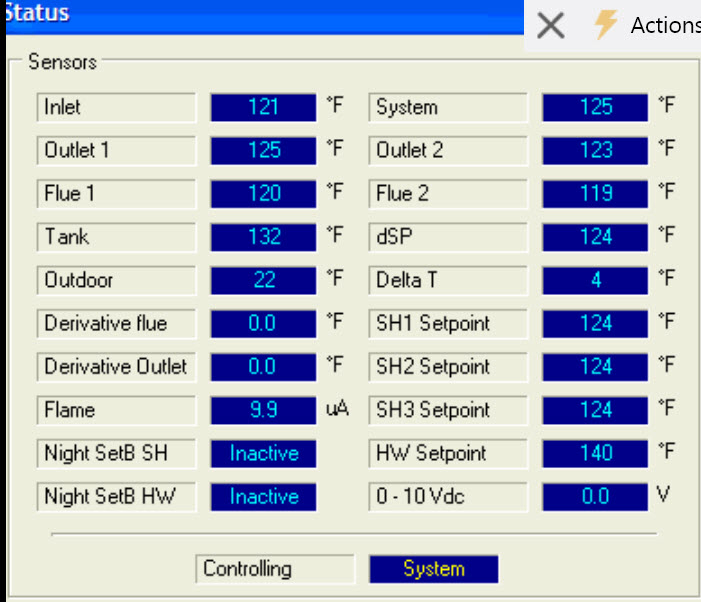 Modulating the primary pump slowed the primary flow down and forced the outlet temp to run at inlet temp + selected delta T. The minimum Delta in the lochinvar settings was 15 degrees. My typical running temps would be something like; SWT 125, inlet temp 122, outlet temp 137. (I'm still pulling back outdoor reset temps to strive for constant circulation like you have achieved!). This means half of the heat exchanger is not in condensing range. I am thinking that the only reason Lochinvar uses this feature is for a non-primary/secondary type system. 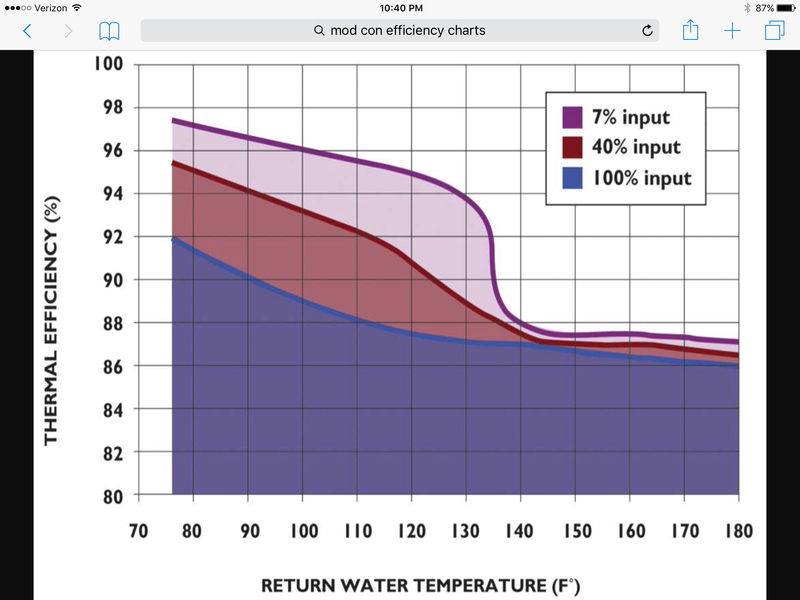 Where slowing the circulation actually lowers the inlet water temp increasing the system delta T.
I have since removed the Nimbus control in favor of a low heat exchanger delta....now the inlet and outlet temps are much closer....like inlet 122, outlet 126. Everything is now in condensing range. I set the primary pump to speed 2 as recommended by the manufacturer and the system pumps to speed 2 also so that the primary flow does not exceed the system flow. That is a great fuel savings BTW. I wish I was able to calculate mine, but i just bought the house halfway through last winter and was heating with oil. I just have to hope that the mod/con is actually saving me money lol. Thank you! I wanted the increased reliability/redundancy afforded by having multiple pumps w/individual controllers (TACO SR501-845RP) vs. one pump/controller & three zone valves. @Adolfo2 that's a clean looking install, very nice. If you run too low of Delta (too much flow) it will flow backwards across the tees/hydro separator and warm up your return. You don't want that, it kills efficiency. 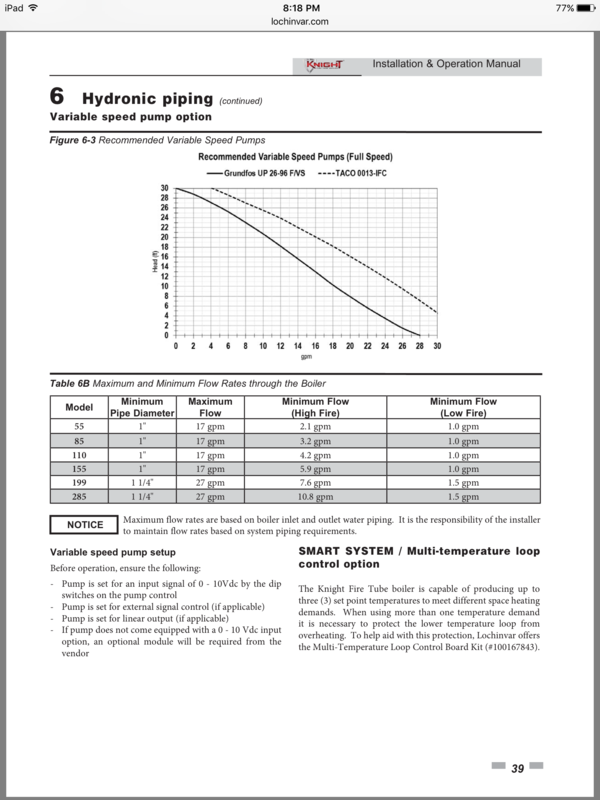 If you're running a fixed primary loop pump speed, you want to run the highest acceptable delta/lowest primary speed/lowest return temp (as determined on high fire), and setup the boiler to run off the system sensor instead of the discharge temp (secondary leaving water temp). That way if the secondary flow exceeds the primary flow it can actually overheat the primary a bit so it mixes the secondary to achieve set point. The boiler should still throttle it's discharge to keep it below a high limit. The caveat there really isn't a point to lowering your primary flow below your min secondary flow. 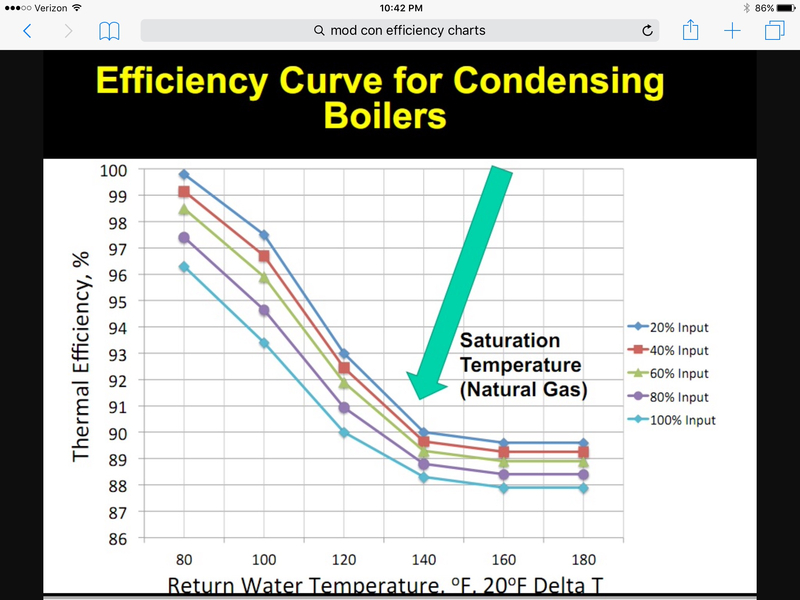 Once the boiler inlet temperature = secondary return temperature, further reductions in flow aren't going to drop the temperature/increase efficiency anymore. Or, in other words. The return water temp is dictated by your heating load only if the primary flow isn't exceeding your secondary flow. 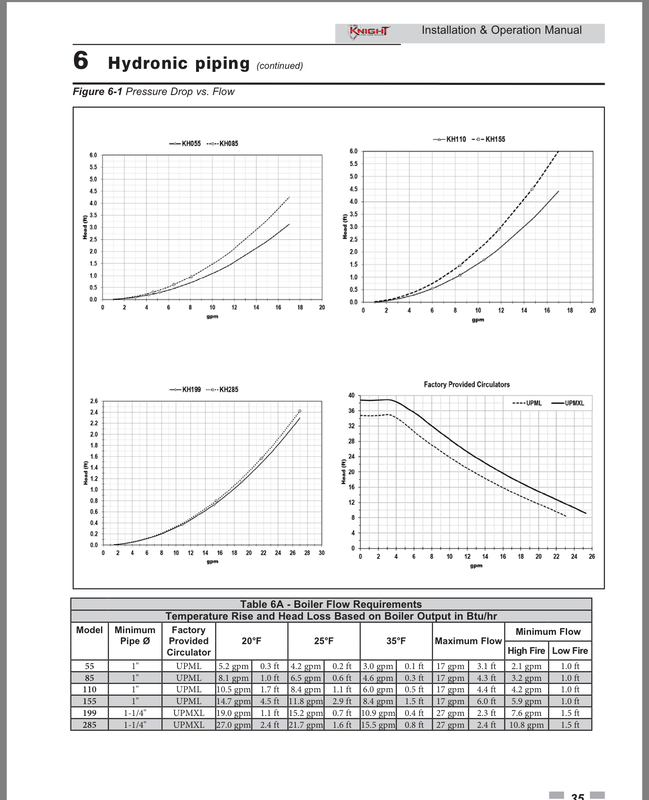 Lochinvar's 0-10v primary pump speed control is a good solution when properly setup. It basically keeps you from over pumping your primary when the boiler is modulated down. Thank you and Happy Thanksgiving! I’m no pro either but had to educate myself in order to dial-in the system. It’s been four years and I’m still tweaking it! 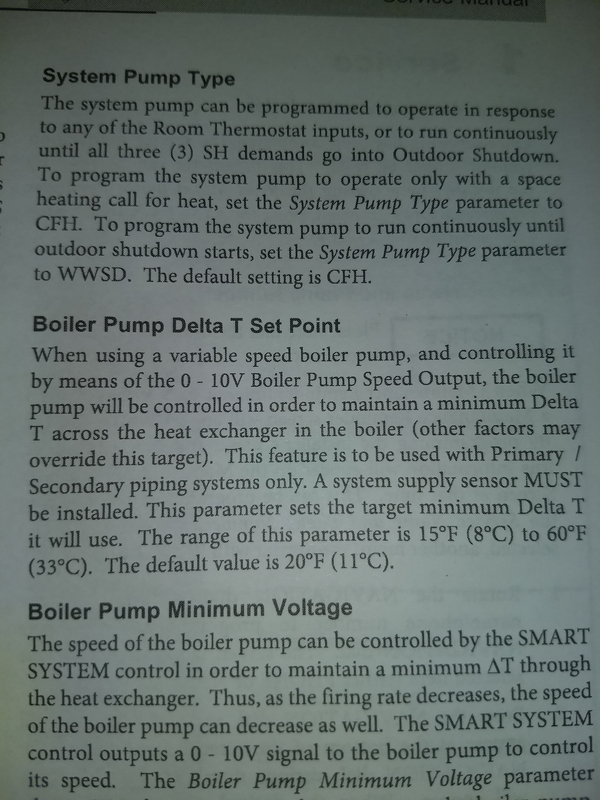 I don’t believe I have the “select your delta-t” feature/control on my system or I may have just skipped that part in the manual since my boiler pump isn’t variable speed. 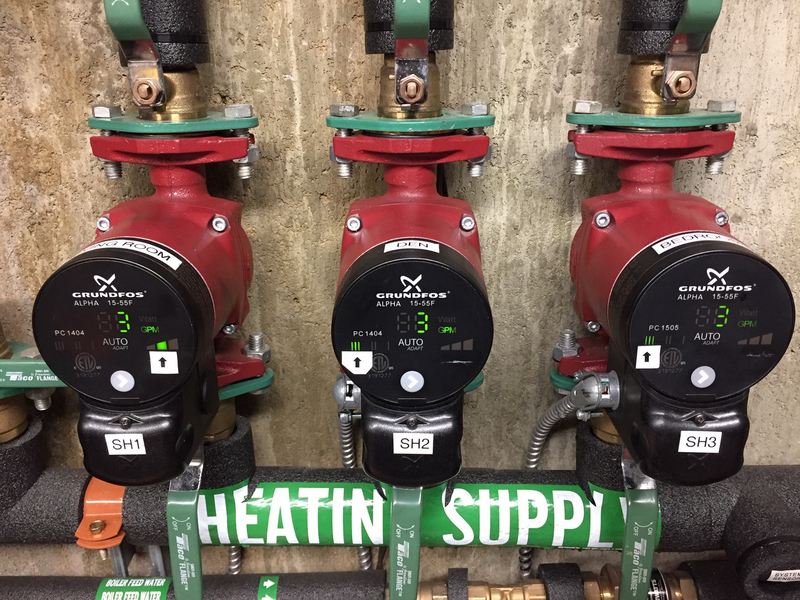 I set each zone pump to give me 3-GPM flow (if memory serves I could select 1 through 4 GPM) as that is the middle of the recommended hydronic flow range for ¾” copper. Not very scientific, but I’m not even sure if the reported flow rate is accurate. Adjusting the boiler pump flow was more difficult as its just downstream from the low-loss header (no back pressure). The least amount of flow I could select was 7-GPM (max was in the low teens). Thus, when all three zones are active (which is 95% of the time when very COLD!) system flow is 9-GPM w/boiler of 7-GPM. Yes, I’m “eating” some boiler water when two zones are active and lots, when only one is, but by the time only one zone runs it’s pretty warm outside so that even the boiler outlet water is well below condensing values. I envy your 10:1 turndown ratio as I only have 5:1 and need to play games in order to minimize short-cycling. In hindsight, the next smallest model (WHN085) with a 50-gallon indirect tank would have been a better fit. To get the most efficiency the system side flow should always be more than the boiler side flow to get the lowest possible return temps to the boiler, always. In a HE, P/S,setup. I use the P/S as anything that decouples two seperate flow rates from system side, and boiler side. 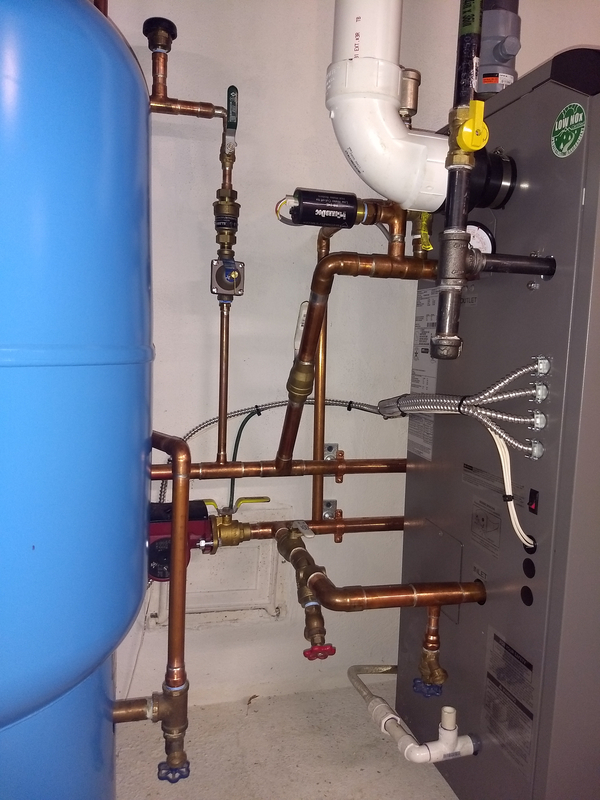 Once the ODR is tuned to its maximum performance, that’s it that’s all you can do to get the highest performance out of a condensing boiler with a system as is. The only other thing is change style of emitter, or increasing emitter surface area. There is one other thing you can do. That is keep your firing rate as low as possible for as long as possible. If you look at the charts I posted you’ll see what I mean. So long as you don’t sacrifice comfort. Thank you & Happy Thanksgiving. I will read this several more times as it's above my pay grade nonetheless my boiler inlet temperature is 121deg (some condensing) this AM, 22deg outside and the house is toasty at 73.